I must say, this truly is the life of a gardener. Be ready at any moment to pull your ‘Wellies’ on because you never know what you may encounter in your gardening adventures. 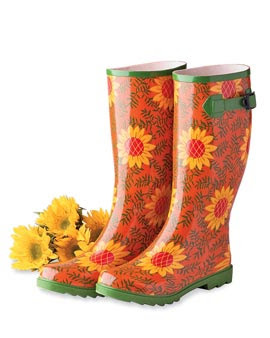 Wellies come in all shapes, sizes, colors, designs – these rubber booties are not meant just for gardening. However, if you want the durable ones that won’t leak, best to leave the fashionable ones at the door. Trust me, I tried with the flower ones (similar to the photo above) and true to form, leaks sprouted very quickly. Although extremely chic, one must opt for a more resilient option if you intend to use in the garden. The boot should be rubber versus plastic, unless you prefer leaks and less-solid footing for the soles. With so many choices, I leave you on your own to discover which ones are suitable for the gardener in your life. A tidbit of history on these infamous boots: the ‘Welly’ originated from ‘across the pond’ in England when Arthur Wellesley, the first Duke of Wellington requested his shoemaker to modify his current boot. The name stuck even through the leather to rubber transition. The Welly is the British equivalent of the American ‘Gunga Boot’ or construction boot. Every Brit owns a pair, residing at the side door for their long field trips or days in the mud. 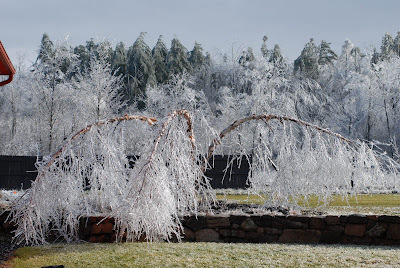 Have a great Friday and thank goodness, even if it is bitter cold, it is not like last year’s ice storm.